What do we get wrong about content marketing? Note the word valuable in that definition. The scope of content that you can put up on your site and spread through social media is limitless, and the value demonstrated by one post versus another will determine the success of any content marketing campaign. Keep in mind, that value is a broad term: a laugh, for instance, is valuable, as is any connection on a human level. Despite its broadness, the value of content typically refers to its informational potency or newsworthiness for your particular target group. Let’s better understand content marketing by looking at ways in which content marketing is misunderstood, drawing on ideas from a couple experts: Salma Jafri of Search Engine Watch and Jay Baer of Convince & Convert. Misunderstanding about content marketing: It’s simple. Content marketing is about building relationships with people, and that often doesn’t happen overnight. People are reasonably skeptical around businesses because as consumers, we know the business wants something from us: our money. Creating rapport and trust with your audience are crucial, so establish clear parameters as you move forward. Advertising campaigns are simpler because the data is obvious. Especially when you can track through web-based ads, you know exactly how successful a campaign is based on click-throughs and conversions. Content marketing is about the long haul. Because it’s not a direct sales pitch, you aren’t likely to see as many immediate actions from customers. It’s about planting seeds. Creating rapport is incredibly complicated, but a lot of it has to do with communication, which is exactly what content marketing is. As Jafri notes, the relatively minimal scars incurred by Buffer as a result of a hacking incident are a good example of how much easier it can be to bounce back from bad news if you have a strong relationship with your users. Misunderstanding about content marketing: It’s fast. Every year the Content Marketing Institute releases its B2B Content Marketing Trends, a compilation of statistical data related to the field. Content marketing can, of course, take on all shapes and sizes and does not have to move at a snail’s pace, but one of the graphs in the 2014 CMI study makes it clear that time is always on the minds of content marketers: 69% of B2B content marketers find that their biggest challenge is not having enough time. Misunderstanding about content marketing: It’s a machine. Of course, online there is a tendency to want to automate processes. Setting the wheels in motion without implementing enough guidelines for monitoring, or generally relying on a mechanized approach that can be a major mistake with content marketing. In fact, Jayson DeMers of Forbes believes that companies will excessively and detrimentally move in a hands-off direction with content marketing next year. Additionally, because you’re speaking from humans to humans, visual appeal is essential to content marketing. Creating an aesthetic design and color combination that is coherent with your overall theme will increase the effectiveness of your content marketing campaign. Misunderstanding about content marketing: Overkill is impossible. Jay Baer notes that with content marketing now in the mainstream, every company (to the extent they participate) is a publisher. He sees that split identity (core business vs. content management business) as the root of an overkill tendency from some parties: the proliferation of vast amounts of content that do not do the company any good. Baer’s perspective is that content marketing becomes much more focused and reliable for a company when everything is geared toward desired behavior from customers following their interactions with the content. He recommends thinking about the end goal and building the strategic plan from that point. In other words, think about the money before you think about the value. The value comes second. That idea is sound but could also be misconstrued. Content marketing is not about straightforward advertising on how great your company is. It’s about finding the right approaches in terms of subject matter, tone, and format; along with finding the right ways to deliver the content in directed ways. Thinking about the money can be the first step to developing your plan, but never forget that value to users is paramount. Misunderstanding about content marketing: It’s words and pictures. 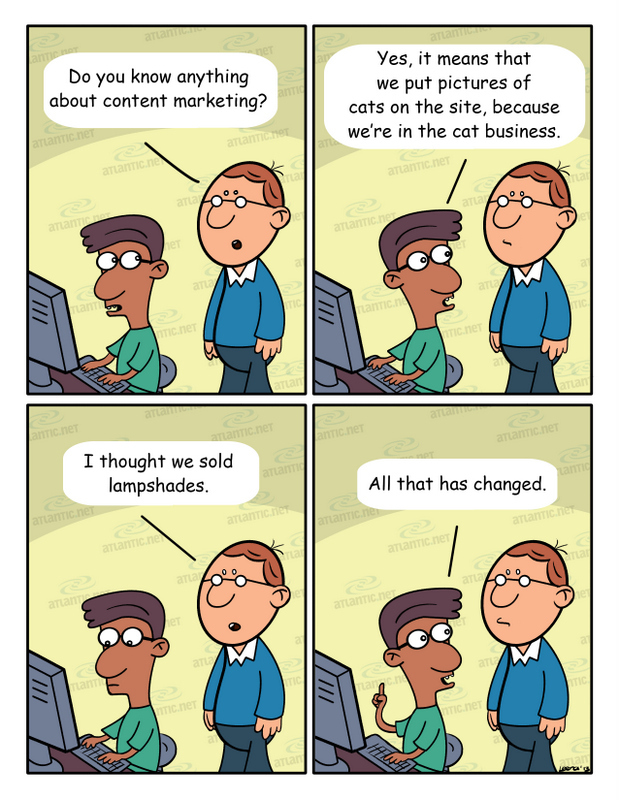 Content marketing is all about creativity. Atlantic.Net’s series of comics about the Cloud Hosting industry is not always considered the most humorous topic but is one example of an interesting format to give you and your customers a new angle on your chosen topics. For more blog articles, community resources, and information about our many hosting options like Linux cloud hosting and PCI compliant hosting among others, please check out our website at Atlantic.Net. What is Content Curation and how should you do it?